of him. And the boy spin-off was such a success, they apparently figured what the heck, let's do a girl too. And so, in Captain Marvel Adventures #18 (December, 1942) Fawcett debuted Mary Marvel. By that time, almost three years after Cap's introduction, young Billy Batson (the orphan boy who turned into Captain Marvel when he spoke the name of the wizard who gave him his powers, Shazam) was no longer living on the streets and making a precarious living selling newspapers. He was working as an announcer at radio station WHIZ, with a show of his own. One day, his guest was a young lady named Mary Bromfield. In the course of the interview, Mary and Billy discovered they carried matching pieces of a broken locket — which led to the revelation they were twins, separated at birth, with Mary winding up adopted by the well-to-do Bromfields and Billy fending for himself. Learning Billy's secret identity (which wasn't really all that secret — even most of the recurring villains knew it), Mary suggested that maybe the power extended to her, as well. Later, threatened with kidnapers, she tried it out, and sure enough — saying the name "Shazam" brought on the magic lightning, which turned her into a female version of Captain Marvel. After mopping the floor with the bad guys, she and Billy visited old Shazam, who explained that while for Billy, his name was an acronym for six male heroes of the ancient world (Solomon, Hercules, Atlas, Zeus, Achilles and Mercury), when she said it, it stood for Selena (the Greek Moon goddess), Hippolyta (queen of the Amazons, as every Wonder Woman fan knows), Ariadne (possessor of great skills), Zephyrus (the West Wind), Aurora (dawn goddess) and Minerva (goddess of wisdom). The story was written by Captain Marvel veteran Otto Binder, whose many contributions to comics include the female superheroes Supergirl (from DC Comics) and Miss America (Marvel). The artist was Marc Swayze, another Fawcett regular, who also illustrated their aviation hero, The Phantom Eagle. Later on, her artwork was generally handled by Binder's brother, Jack, whose studio also did Fighting Yank for Standard/Nedor Comics, Daredevil for Lev Gleason and Fawcett's own Bulletman. Like Junior, Mary got her own series the month after her first appearance. She became the cover-featured star of Fawcett's Wow Comics with its ninth issue, squeezing Mr. Scarlet, who had held that position in most previous issues, into the back pages. Unlike Junior, it took her more than a year to get a comic of her own. 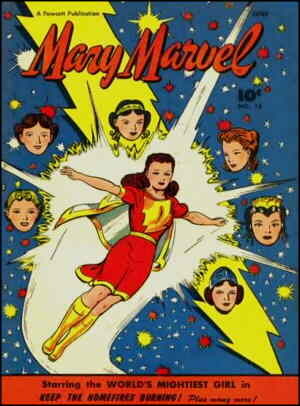 Mary Marvel Comics #1 was dated December, 1945. That same month (the timing probably had to do with the lifting of wartime paper rationing), she began regular team-ups with Cap and Junior in the new Marvel Family title. Mary wasn't as successful as Cap and Junior. In 1947, she lost her series in Wow Comics, which began emphasizing humor features; and in '48, after 28 issues, her own comic was replaced on the schedule by one starring the western hero Monte Hale. But she stayed in Marvel Family until the end, which came in January, 1954, as a result of Fawcett getting out of the comic book business (after having had enough of the Superman copyright infringement lawsuit DC had been waging for well over a decade). DC acquired Captain Marvel and his spin-offs in 1973, and starred them in its series Shazam! That series lasted five years, and has been revived and refurbished from time to time ever since. In 1975, she was considered for a TV series, but the producer, Filmation opted for a new character, Isis, instead. She's even been a member of a group at DC, independent of the other Marvels — a revival of a 1980s Justice League of America spin-off called "Formerly Known as the Justice League", but that didn't last long. Tho she's been out of the limelight for years, Mary Marvel is still a familiar sight to comic book readers. Text ©2004-10 Donald D. Markstein. Art © Fawcett Publications.